On January 10, 2017, mama Amanda went to the hospital with contractions. 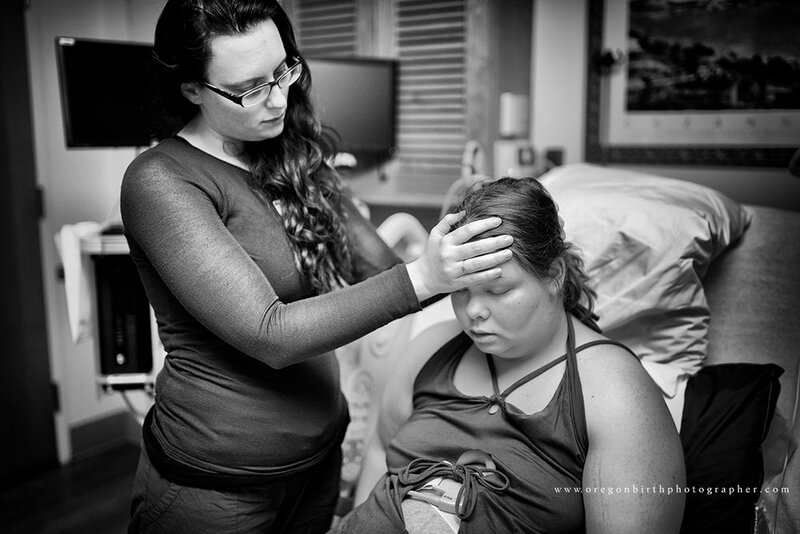 Her doula, Jessica, was keeping me informed of how things were progressing. A huge snow storm was predicted for that night. If you didn't know...Portland doesn't really get snow...or I should say, doesn't DO snow very well. Around 5pm with Amanda 4 cm dilated and contractions 4-5 minutes apart, I headed to the hospital in an effort to avoid the chaos that could happen on the roads later in the evening. 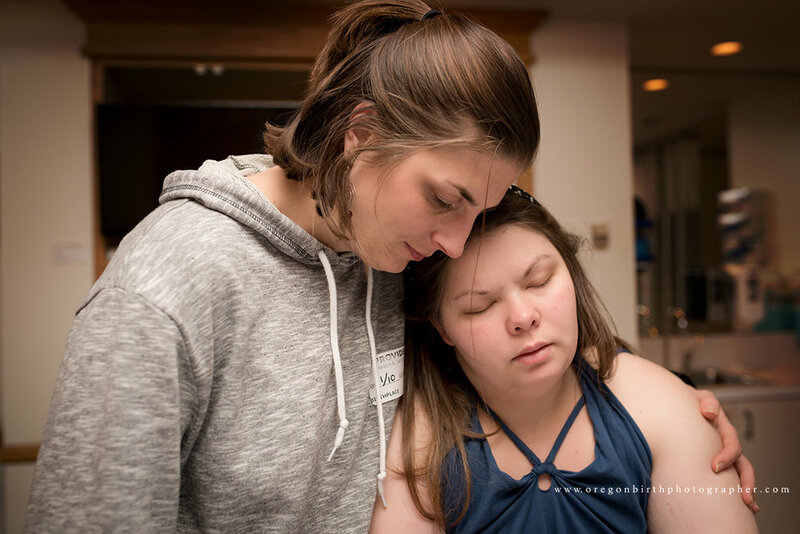 Amanda was being supported by her doula, Jessica, as well as her sister-in-law, Laree, (who also happened to be a doula but took a support role for this birth) and her husband, Ben. 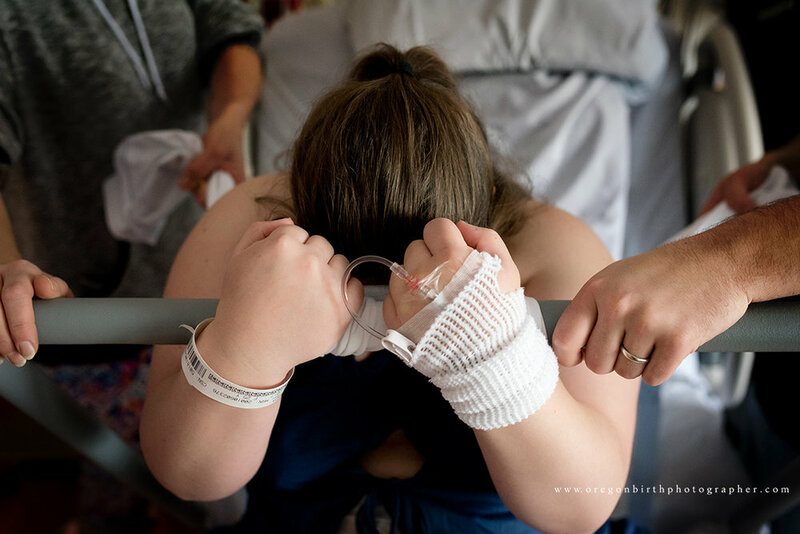 Shortly after I arrived, Amanda's contractions slowed and she continued to endure and labor naturally all through the night. She took some time in the tub as well as walking the halls. She was surrounded with SO MUCH LOVE! Jessica was amazing…applying counter-pressure and teaching Ben how to do hip squeezes with every contraction. My arms were sore just watching this labor team support her. And Amanda was SO STRONG. I’d never seen a mama with such resolve and focus through each contraction. 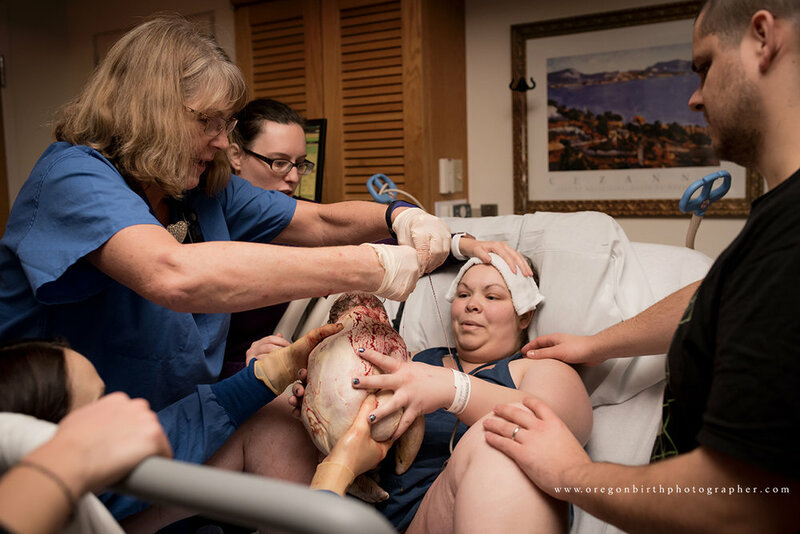 She was determined to labor naturally and doing so beautifully. Because the snow storm had hit full force (nearly 6″ had fallen – that’s a ton for Portland! ), we were unable to leave the hospital. In fact the freeways and major roads were being shut down unless you had chains. The waiting room was littered with visitors and staff. Providers were camping out in the on call rooms, and our birth team took turns sleeping in the waiting room. It was nuts. Amanda continued to ride contractions and make progress very slowly. 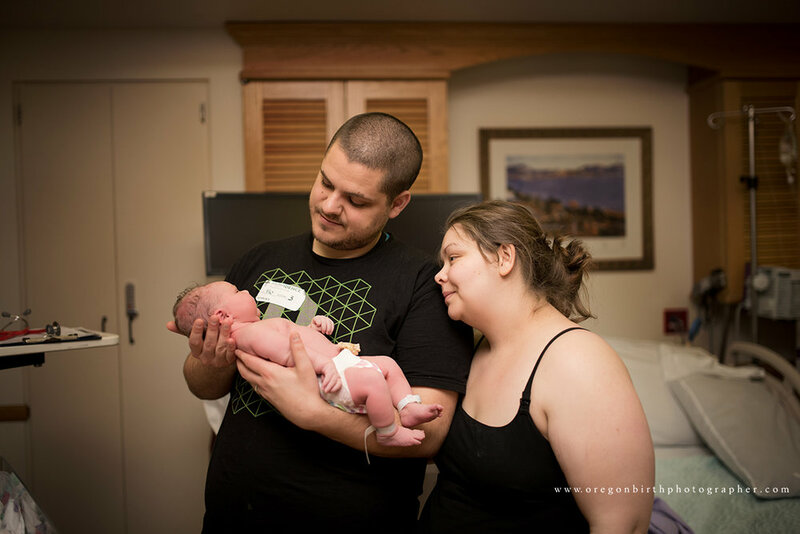 30+ hours in a small hospital room together, we were all beyond exhausted, but it was Amanda that rallied, and when she was finally complete, was able to push out her baby. Finally on January 12 at 2:10 am, 43 hours after her first contraction (and 38 hours after I arrived!) little Hannah was welcomed into her mama’s arms. No wonder Amanda had to work so hard...she weighed in at 9lbs 4 oz! 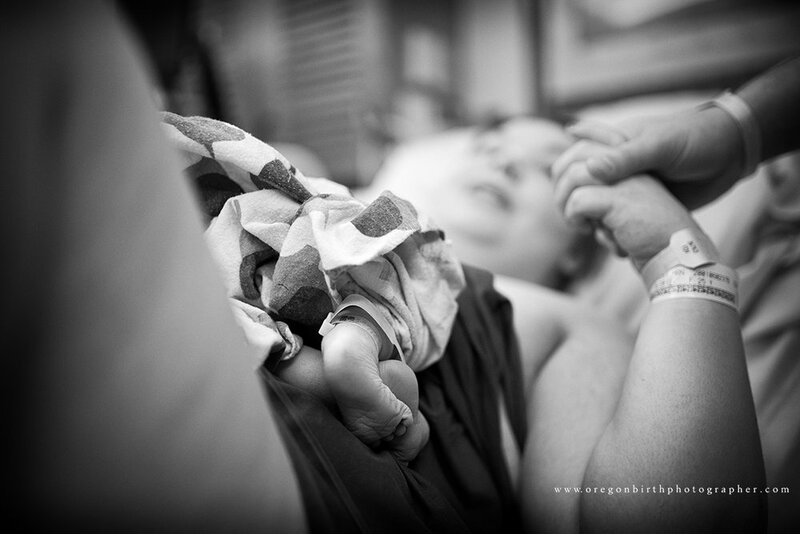 Birth photographers have to be prepared for everything. 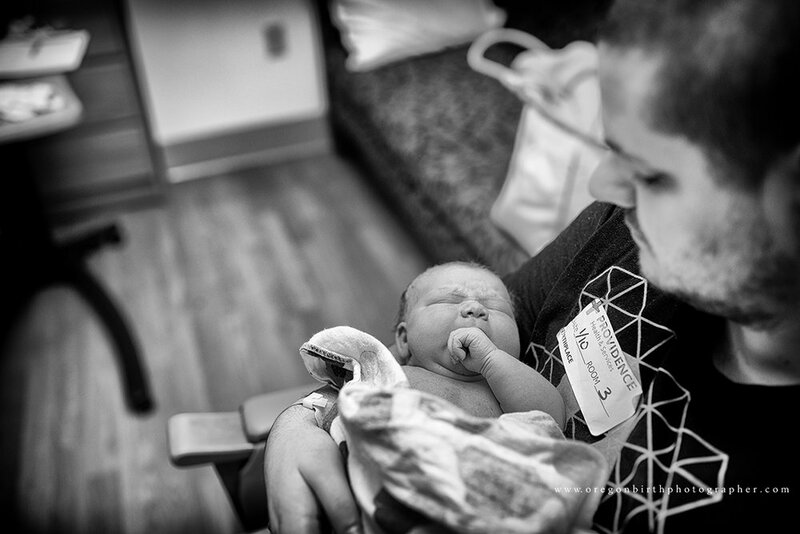 Make sure you're ready for on-call life with the Birth Photography Toolkit.